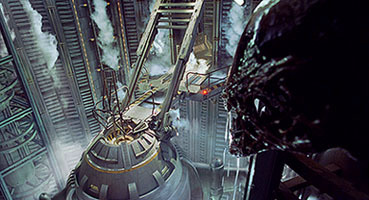 Over the alien's shoulder, we are delighted to a Duboi composite of one of their intricately detailed matte paintings. The alien is an Amalgamated Dynamics on-set creature effect. 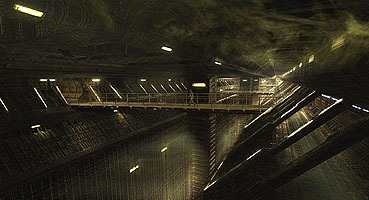 Another multi-layered Duboi composite, this time depicting the vast corridors of the interior of the ship. To prove that she's not entirely human, Ripley shoves a sharp knife through her hand. For this shot, Blue Sky|VIFX's LA facility created a 3D knife blade, and then did some tricky compositing to make it appear as if the blade cuts through Ripley's hand. Perfect matchmoving and compositing (supervised by Dave Gutman) was key to this sequence, due to the extremely tight camera angles.